BelarusDigest > All > Can Belarus Stick to Neutrality Despite Russian Pressure? Last week, pro-government Russian experts and media launched a new series of attacks on the Belarusian government. Minsk, they insisted, is going the way of Yanukovych's Ukraine. Russian commentators agree on that regardless of their ideological colours. Be it the liberal Kommersant daily, government-affiliated think tanks or the radical right-wing Zavtra daily. They warn Lukashenka of Yanukovych's fate. The attacks have been triggered by Lukashenka's statement that the issue of the Russian airbase is far from settled. Minsk already irritated Moscow by its cautious building up neutrality since the late 2000s. 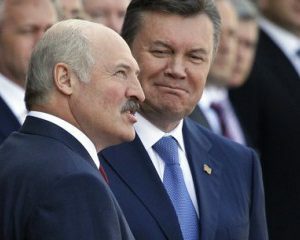 Moreover, while earlier Minsk could collude in Russia's politics with influential right- and left-wing elements who dreamt of restoring a multinational empire, it now has to deal with new powerful forces which hate compromise with allies like Lukashenka. Exclusive Russian nationalism is ever more influencing Moscow's policy. At the beginning of October the Belarusian Embassy in Moscow held an expert video conference between Moscow and Minsk on the “Prospects of Belarus-Russian Relations in the Context of Presidential Election in Belarus.” From both the Belarusian and the Russian sides, only well-known experts close to the respective governments participated. For Belarus, there were Vadzim Hihin, Yury Shautsou, Siarhei Kizima and Alyaksandr Shpakouski. Russian nationalist experts seemingly believe this rhetoric. They argue that Lukashenka with his doubtful loyalty to Putin's policies does not represent the Belarusian people. They refer to presumably neutral surveys of public opinion in Belarus which show high support for Russia's annexation of Crimea. Just a decade ago, Russian nationalists (to be differentiated from imperialist groups which reject its more ethnically-based ideas) existed as a marginal group without serious political clout. Now, they grow ever stronger in Putin's state as another recent political show has demonstrated, too. On 25-26 September, the conference “Russophobia and Information War Against Russia” in Moscow for the first time featured a series of presentations on problem of Russophobia in Belarus. It also alleged that Russophobia was committed by the Belarusian state. The presenters included prominent Russian nationalists from Belarus who had challenged the Belarusian government, like Andrei Herashchanka sacked from Belarusian public service for Russian chauvinism. The event served as a stern warning to Lukashenka because the conference was not a shabby meeting of right-wing radicals. Two organisations close to the Kremlin and a group of deputies of the Russian Duma had organised the event and Russia's Deputy Prime Minister Dmitri Rogozin spoke at it. The lack of acceptance for more neutral Belarusian positions seems to be universal in Moscow. Last Thursday, Maxim Yusin wrote in the liberal Kommersant daily that Lukashenka in his negotiations with Moscow was feeling surer than never before. Minsk pursues a multidirectional foreign policy, and foreign powers strive for influence over Belarus. According to Yusin, this policy of balancing between Russia and the West is similar to that of Ukrainian President Viktor Yanukovych before his toppling in 2014. The same fate can befall the Belarusian leader, he implies. Lukashenka and the West are coming closer to one another. He, in fact, has occupied the niche which earlier was occupied by Ukraine in the former Soviet Union. That is the niche of a mediator between the East and West. Russia does not need such a mediator. But it is ideal to which at this stage aspires the Belarusian leader. Remarkably, it was the newspaper which for many years fiercely supported Lukashenka that has printed Zatulin's words. Minsk used to be able to reach parts of Russian establishment through Zavtra and its authors. The Belarusian authorities felt the Russian establishment's tilt towards a more aggressive nationalistic policy and have responded accordingly. Although the Belarusian Constitution declares the neutrality of Belarus, for many years it has remained a dead letter. That changed in 2006 as divergences with Russian foreign policy emerged. Minsk continued to go out of its way to preserve friendly relations with Moscow, yet established good relations with Ukrainian president Yushchenko and Georgian president Saakashvili, and refused to recognise Russian-supported independence for South Ossetia and Abkhazia. Minsk also refused to extradite Bakiev to the new pro-Russian government of Kyrgystan. Belarus​'s refusal to accept Russia's annexation of Crimea and ambivalent stance on the conflict in Eastern Ukraine are just some of the latest illustrations. Belarus effectively started to implement the neutrality clause of the Constitution. That does not mean automatic acceptance of this neutrality by others. In the eyes of pro-Putin Russian politicians Belarus can either be with Moscow on all and every issue or against it. It cannot simply be an ally with its own position on some issues, even if this is a neutral position which does not oppose Russia. Unfortunately, Minsk finds it difficult to persuade Western countries about its possibilities to act independently of Moscow, too. After his recent visit to Berlin, the chief of the Belarusian Nasha Niva daily Andrei Dynko wrote that German politicians do not trust Lukashenka and believe that the Kremlin can enforce any of its decisions on Belarus, including the plans for an airbase. Indeed, Belarusian neutrality is very limited and the Kremlin maintains significant influence in the country. Yet Finland after WWII succeeded in building neutrality in not identical yet comparable conditions of tight Soviet control. Helsinki merely avoided confrontation with Moscow, accepted legitimate Soviet interests while building its own country and gradually developing more independent and neutral policy. Belarus could do the same. Maybe, its the only way to survive as an independent nation. Thanks to recently launched applications Belarusians can now complain to the authorities in a less formalised way. One of them, Comfortable City, helps creating appeals and petitions to the state bodies. Be a Man, not a Sheep! – a new project Studwatch.org encourages students to protect their rights. Pact launches a series of memos based on community polls in Belarus. It can help to better understand the needs and challenges of local communities. New online platforms for appeals to state bodies. Minsk web programmer Valery Koldachev launched the web site One-Window-Online, which allows to send information about problems in Minsk to the state body that can fix it. This week one more online platform has been launched – Comfortable City that helps creating appeals/petitions to the state bodies and collect signatures under them. In both cases appeals have a legal force so officials should respond them. The similar online projects already work in Belarus for some years –e-appeals to state bodies Zvarot.by and complaints on roads Belyama.by. Pact releases first in series of Belarus community polls. This week, Pact begins to release a series of memos based on community polls in Belarus. The first memo is dedicated to the village of Komarovo, and will be followed by five additional memos released before the end of 2015. Pact’s goal for the community polls is to provide easy-to-use feedback directly from a local community in order to better understand community development (supply) needs and challenges. A local research company, SATIO, carried out the first community polls. The Russian-language version of the analysis is available at the web site of Pact's Community Development Fund. Charitable auction of meetings MajeSens celebrated 4 years of its activity in October. To the moment, the platform has collected about 320 thousand dollars for charity issues. MajeSens allows everybody to put up a meeting with him/her or to win meeting with other person. The money obtained is transferred to a charitable project, available at the web site. New manual on capacity building for Civil Society Organisations. New Eurasia Establishment presents the first edition of its manual "Diagnosis and Planning of CSO Capacity Building", developed in the framework of Strengthening the Capacity of Joint Initiatives project. The manual is designed specifically for Belarusian CSOs and intended for managers and leaders of organisations and consultants. New project Studwatch.by encourages students not to be afraid to protect their rights. Among the tools the organisers suggest to become election observers, report on violations to human rights defenders in the elections, disseminate information, etc. The slogan of the new project: Be a man, not a Sheep. Week against the Death Penalty in Belarus. On 5-10 October the Week against the Death Penalty to place in Belarus, Lithuania, Poland, Ukraine, and Kazakhstan. On 7 October the discussion Murder on Verdict was held in Vilnius with the participation of the Belarusian human rights defenders, journalists and representatives of the Foreign Ministry of Lithuania. The event presented the film Six Arguments against the Death Penalty telling about the disproportionate character and cruelty of the death penalty. European Parliament held a discussion on relations between the EU and Belarus after the presidential elections. On 14 October discussion was organised by the EaP Civil Society Forum and the European Parliament delegation for relations with Belarus. The Belarusian side was represented by Anna Herasimova (the Belarusian Human Rights House), Vladimir Dunayev (Public Bologna Committee) and Andrei Yegorov (Centre for European Transformation). Independent observers developed a mobile device for easy collection of information from voters through smartphones. Application named as Vochy/Eyes informs on voting rights and creates a mobile platform for the transmission of information on violations of the election independent observers. The collected information is published on the web site of the national monitoring of the election campaign electby.org, known in Belarus since 2010. Minsk development plan draws attention. On 14 October Minsk municipality presented to media a new General Plan of Minsk 2030. The presentation also sparked the interest of more than a hundred citizens that joined the meeting. And as a follow-up, several civic initiatives join forces to protect their communities from Minsk City Council. Supreme Court denies BCD’s complaint. The Supreme Court has denied the complaint about the Ministry of Justice lodged by the steering committee for the creation of the Belarusian Christian Democracy party. The BCD steering committee wanted to appeal the refusal to register the party. It is the fifth time the BCD has been refused registration as a party. The BCD has also tried registering as a civil organisation 19 times. Blogger Anton Matolka wrote a letter to Minister of Internal Affairs Ihar Shunevich. He is asking to explain the legal grounds of arresting citizens with national symbols (the white-red-white flag and the emblem Pahonia). 5 people were detained in Barysau Arena on 12 October and a man who had a white-red-white flag in his car was stopped by driving inspectors the day before. Beltelecom proposes the independent websites an additional protection from DDoS-attack on the Election Day. Namely, the state-run telecommunications operator has made the relevant oral proposition to Nasha Niva, Onliner.by and TUT.by. The service is free. Thus Beltelecom wants to be saved on charges of blocking and DDoS-attack. Russian air base protesters summoned to court. The participants of the unauthorised action For Peaceful, Neutral Belarus gathered about 400 people in the centre of Minsk on October 4 stand trial in Minsk's Central District Court on 9 October. Leader of the UCP Anatol Liabedzka, ex-presidential candidate Uladzimir Niakliayeu, former political prisoner Mikola Statkevich and several more activists have been summoned to court.